Sagar Salunke may be heading for the kind of fame Slumdog Millionaire stars Rubina Ali and Mohammed Azhar enjoyed when their film was nominated at the Oscars last year. The young 16-year-old boy stars in American director Gregg Helvey's Kavi, which has been nominated in the Best Live Action Short Film category this year. 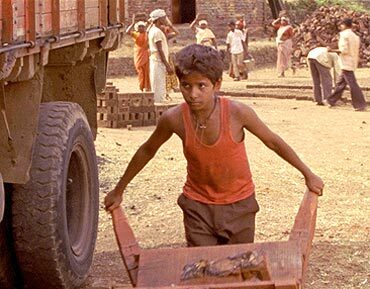 Kavi deals with the issue of child labour in India, where a boy named Kavi is forced to work in a brick kiln even though he wants to go to school. Sagar's life is similar in many ways to his screen character. For starters, he spent his life living in the slums (in Jogeshwari, a western suburb of Mumbai), facing a dull future. But fortunately, Sagar was able to have a school life -- he is now in Standard Nine in a Marathi medium school called Indian Education Society. Until a few years ago, his father Ashok earned a paltry amount of Rs 2,500 per month, working as a cable operator. Mother Neetu contributed to the monthly income by working as a maid. Sagar's older brother Deepak juggles college with a job at a lawyer's office. Brother Sujit studies in Standard 10 while sister Chanchal is married. 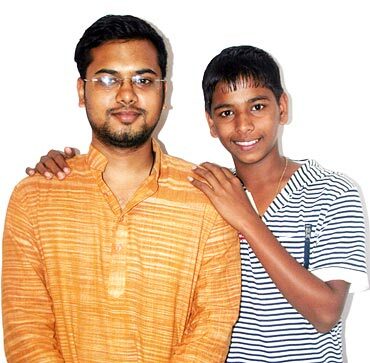 Life changed for the boy in 2007, when he was offered the film Kavi, and Sagar can now hope to have a decent future. Lady luck was certainly shining on Sagar the day he landed his first film Bits And Pieces, directed by Manmohan Mahapatra and starring Rahul Bose and Dia Mirza. He was playing cricket in the slums of Jogeshwari, when a casting director -- who happened to be in the vicinity -- asked Sagar if he was interested in acting in a film. Nine boys were selected from the area, and were sent for training for a month. Sagar was finally selected. Bits And Pieces led Sagar to his second film Kavi. Sagar, who did not know English at the time, was not scared to be part of a film where the director was American. "The whole crew was Indian and the film was in Hindi," Sagar explains. "Only the director was a foreigner. There were many people, who would translate his words to me." Gregg also helped Sagar get over any fears he may have had by holding a month-long workshop. Since the film was only 19-minutes long, Sagar would rehearse every scene over and over again. "When Sagar got the film, I thought it would not be a good idea because he would have to bunk school," Sagar's father Ashok said. "But the production team spoke to the school's principal and made sure that Sagar did not lag behind in his studies. I am not educated but I am trying to educate my children." Sagar took only 10 days off school when it was shot in a village called Shirvil, in Wai, Maharashtra. Sagar was only 14 when he started shooting for Kavi in 2007. He did not fully understand the film's concept of child and bonded labour. "When I was shooting for the film, I did not understand what bonded labour was," he says. "But now, I realise what they were saying in the film. Now, I have understood the film, and liked it too." Sagar's character may have had a heartbreaking story in the film but off screen but Sagar enjoyed himself. He discovered his love for Good Day biscuits, and demanded that the crew get it for him. "I was so stubborn that I would refuse to shoot until I get my biscuits and tea," Sagar smiles. "I would eat 10-12 packets a day. I fell in love with these biscuits because there was a scene in the film when a social activist gives me a Good Day biscuit packet. After eating a biscuit, I fell in love with it. And then I wanted it all the time. Now when I think of it, I regret it. It was quite childish." Even though this is Sagar's only second film, his acting was marvelous," said 22-year-old Achin Jain, who worked as a production manager on the film. "There was a scene in which Sagar had to cry. He could not stop crying for half an hour after the scene was shot. I thought that was a big deal for a kid. He had not even used glycerin." 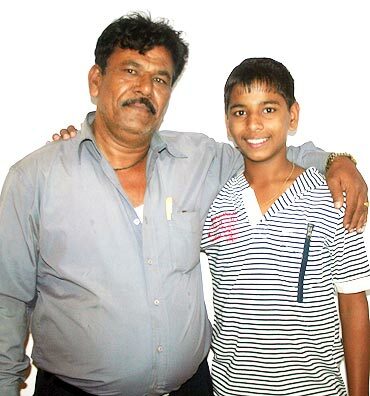 Sagar confides that the memory of his father's heart attack made him cry. "Gregg told me that I should remember something that will make me sad," he explains. Ashok's heart attack came at a time when the family was not insured, and it left them scurrying for finances. Now that Kavi has been selected for the Oscars, Sagar is busy making plans. 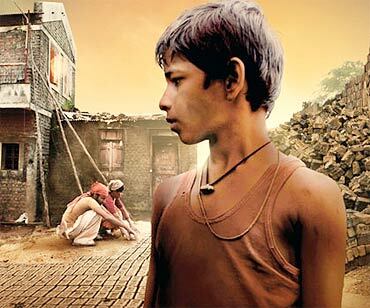 The poor boy from the Mumbai slums will get a chance to go to Los Angeles, and attend the prestigious Oscar ceremony. The film's producers Guneet Monga and Harsih Amin will accompany him. "I had watched the Oscars last year when Slumdog Millionaire won," Sagar said. "I want to go to the Oscars and win. I don't want to return empty-handed." He is very excited about going to the US. "I have seen photographs of the hotel where I will be staying. It is very beautiful. Just looking at the pictures has made me excited," he beamed. Plus, Sagar is looking forward to his sight-seeing plans, and dressing up in designer clothes! "I don't know many English actors; I only know the hero of Titanic," Sagar said. "When I go to the Oscars, I want to meet him. I want to see the Statute of Liberty also! If I have money, I will shop there as well." "I never thought my son's film would go to the Oscars, and he would make me so proud," Ashok said, wiping a tear. "I want him to do whatever he wishes." It has been three years since Kavi was shot, and life has improved considerably for the Salunkes. They have moved out of the slums, and now live in a chawl. Ashok's salary has increased to Rs 10,000. Sagar has also landed a film called Zara Sambhal Ke, based on AIDS awareness, and NDTV Imagine's television show, Angrezi Khete Hain.